Dial indicating torque wrench tester with mechanical loading device. 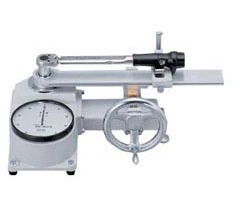 Calibration or adjustment for torque wrenches. Dial indicating type with mechanical loading device. Easy-to-read measurement with a large size of dial. Since measurements are performed by setting the torque wrench horizontally, wrench weight correction is not necessary. Since loads can be correctly applied to the effective length of the torque wrench with the loading device errors caused by improper application of force are considerably reduced. Load can be applied easily and slowly for accurate calibration. Measurement for clockwise direction only. Special specifications, such as counterclockwise measurement, without loading device, etc., are supplied upon request.